The Garrett County Board of Education acknowledged a school recognition at its recent Board meeting on June 21, 2016. Mrs. Cynthia Downton, Board member, recognized Swan Meadow School for “The Kids Helping Kids Food and Fund Drive”. 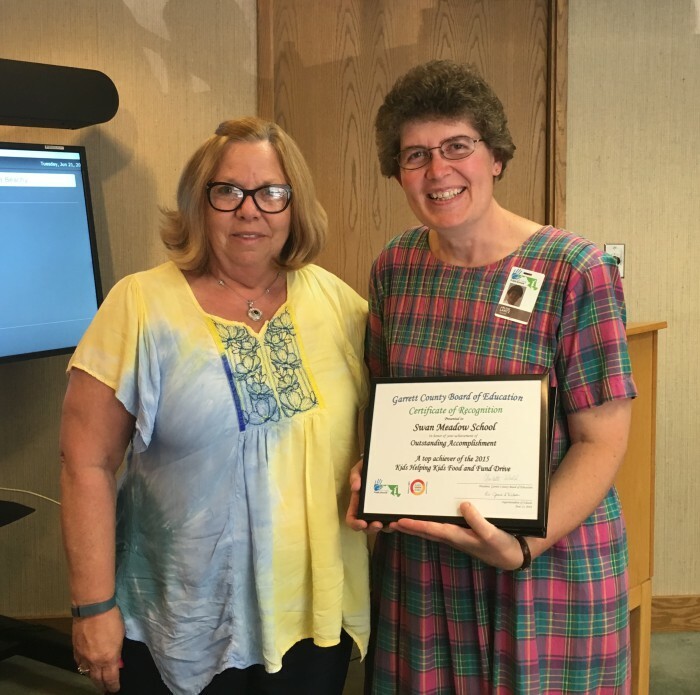 Swan Meadow School was recently recognized by the Maryland State Department of Education and the Maryland Food Bank for being a top achiever in the Kids Helping Kids Food and Fund Drive. The Kids Helping Kids Food and Fund Drive provides an opportunity for students to collect non-perishable food items as well as monetary donations that go to community food banks. The Kids Helping Kids Food and Fund Drive raised more than $104,000 and collected more than 420,000 pounds of food to help feed hungry children across Maryland. As a top achiever, Swan Meadow School, was honored with a special Education Citation and a school-wide gift for their students on Thursday, May 9, 2016, at the Maryland Food Bank in Baltimore, MD. The Board would like to not only recognize Swan Meadow School, but also Mrs. Jessica Beachy and Ms. Emma Beachy, who were contributors to the school’s successful campaign and represented the school at the May 9th awards ceremony. Mrs. Arlene Lantz (right), teacher, accepted the recognition on behalf of Swan Meadow School.